The Mac’s utility mat incorporates a lot of clever thinking and design that elevates a classic concept. It makes working more comfortable. We aren’t exactly sure how a company renowned for high-quality tie-downs develops a work mat as a product. We can only guess that Mac’s owners and employees actually work on their own stuff, hook up their own trailers and occasionally have to slide under their vehicles. We routinely carry a small gardening mat to kneel on while connecting the trailer or changing flats. We also stand on it to change into riding gear. But our little mat seems so lame after working with the Mac’s utility mat. 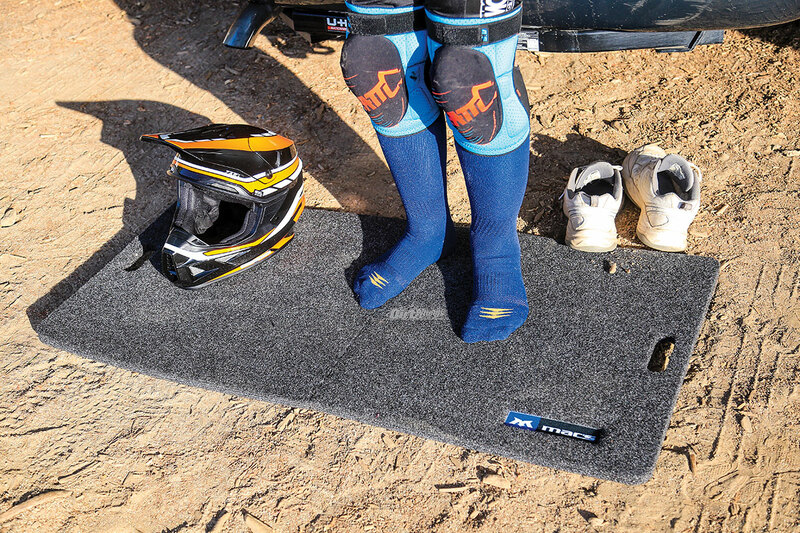 This knee-saving mat is a full 2 feet by 4 feet. It folds in half, and it has hand-holds punched in the padded material so it is a breeze to carry and store. The little mat we used to carry is foam rubber like the sole of a flip-flop, but the Mac’s mat is a cushy, tough, 3/4-inch-thick plastic foam pad with a somewhat slick feel to the side that touches the ground. The opposite side has something like automotive carpet made with 100-percent polypropylene plastic fibers. This soft material side makes the mat comfortable to the touch, and it is stain-, oil- and chemical-resistant. If you want some extra padding, use the mat folded and you have a full 1.5 inches of cushiness. We generally use it folded for kneeling to work, but use the mat open when we are using it like a creeper to slide under a vehicle. It’s made of a similar material to that used in life jackets, so it won’t retain water and can’t mold or mildew. When it is folded down, it is easy to stash in the truck or trailer.